BOZEMAN, Montana, June 1, 2010 (ENS) – A Montana court has rejected an attempt by the Montana Stockgrowers Association and two ranchers to require the Montana Department of Livestock to haze, harass and slaughter all bison that cross the Yellowstone National Park boundary into the Horse Butte area of Montana. 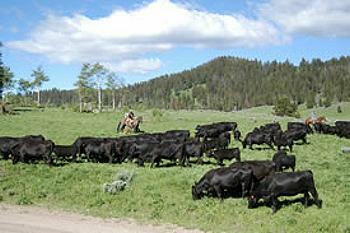 The 2008 lawsuit was filed by rancher Bill Myers; the Sitz Angus Ranch, located in Dillon, Montana, near Yellowstone National Park; and the Montana Stockgrowers Association, a non-profit organization representing nearly 2,500 members. The ruling was handed down Friday by Judge John C. Brown of the Montana State District Court in Gallatin County. The judge ruled that the Stockgrowers association and the other two petitioners do not have the legal right to require these actions under the Interagency Bison Management Plan, which is an agreement among four federal agencies and one state agency. Represented by the public interest environmental law firm Earthjustice, eight Horse Butte landowners and residents, joined by the Greater Yellowstone Coalition and the Natural Resources Defense Council, intervened in the lawsuit to prevent the assault on Yellowstone bison. Horse Butte, located north of West Yellowstone, Montana, occupies a peninsula of land that extends westward into Hebgen Lake. Each spring, bison migrate across the park’s western boundary to get to lower elevation foraging areas, including Horse Butte, that provide the earliest new grass each spring. Although no cattle graze on Horse Butte at any time of the year, bison there are the subject of an aerial and ground hazing operation every spring intended to drive them back into Yellowstone National Park lest they transmit the disease brucellosis to Montana livestock. Brucellosis is an abortive disease of cattle and of bison and elk caused by the bacteria Brucella abortus. The bacteria are shed from an infected animal at or around the time of calving or abortion. According to the University of Idaho College of Natural Resources, there are “no documented cases” of brucellosis transmission from wildlife to cattle in natural settings that have ever occurred. 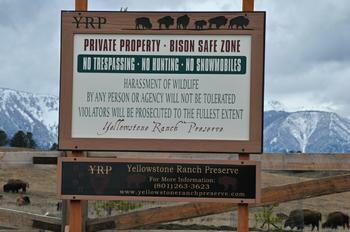 Nevertheless, the hazing of Yellowstone bison is performed under the 2000 Interagency Bison Management Plan. In December 2008, the partner agencies, including the Department of Livestock, modified that plan to allow greater tolerance of bison on Horse Butte. The Stockgrowers’ lawsuit asked the court to order the Montana Department of Livestock to haze, capture, or kill all bison entering Horse Butte, regardless of new information or changed circumstances, such as the absence of cattle on the Horse Butte peninsula and the pro-bison attitudes of Horse Butte property owners. While the risk of brucellosis transmission to cattle was cited to justify the capture and slaughter of Yellowstone bison, in this case the Montana Stockgrowers Association has demanded that bison not be allowed even on cattle-free private and public lands in Montana. Bison are the only native wildlife species still unnaturally confined to the political boundaries of the park. 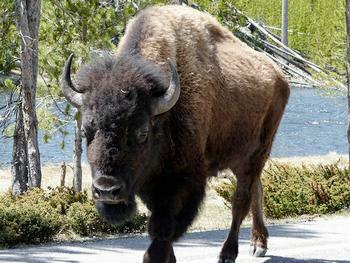 In the past weeks, hundreds of bison have been hazed on the park’s western boundary. The Horse Butte property owners and residents who intervened in the Stockgrowers’ case are Edith Ford, Joa nne Mayo, Ed Millspaugh, Tom Sheperd, Ann Stovall, Joann Stovall, Karrie Taggart, and Jeannette Therien. While not part of this lawsuit, the nonprofit Buffalo Field Campaign documents the hazing of bison in the Horse Butte area. “He again trespassed with the helicopter, scaring off over 100 buffalo with nearly 50 newborn calves, as well as an injured mom and young bull we saw caught up in last week’s haze. No doubt the incessant hazing has worsened their injuries,” the BFC observer wrote.